Baby gates should make life easier, not harder. 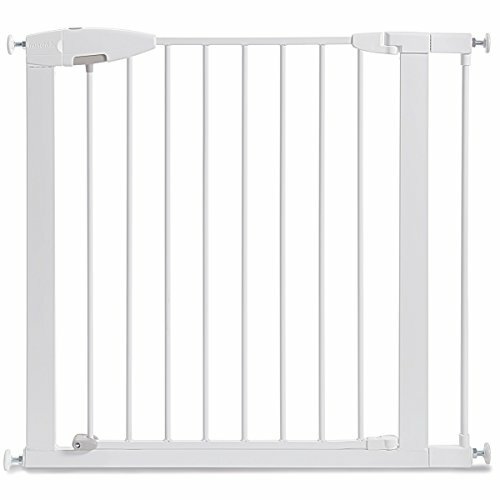 The Easy Close Safety Gate by Munchkin comes in an easy-to-open package and features a simple locking mechanism, no fiddling required. To close the gate, simply release the handle with a firm push and the gate will lock shut. There are also two bottom locks to allow greater control over how the gate opens, for better peace of mind. Ideal for use in doorways, stairways, and halls, this easy-to-use child gate stands 29.5" tall and adjusts from 29.5" to 35.0" wide. This package includes (1) 2.75" extension. Additional extensions can be purchased to fit openings up to 54". Suitable for children 6 to 24 months. Installation Note: This gate ships with a gap between the gate frame and the handles. This is not a defect. The gap will close once gate is properly installed. Safety Warning: Do not use this gate at top or bottom of stairs without using all four wall cups. For maximum safety, use four wall cups with sticky pads and screws provided when installing the gate in all locations. Measures: 29.5" tall and 29.5" - 35" wide with the included (1) 2.75" extension (fits up to 54" wide with if additional extensions are purchased). Measure your desired opening prior to purchase to ensure a proper fit.